If you’re going to the Edinburgh Festival this summer (August, to be precise – and alarmingly a mere two weeks away) then we will insist, weepingly and pleadingly, that you come to our debut full-length show. 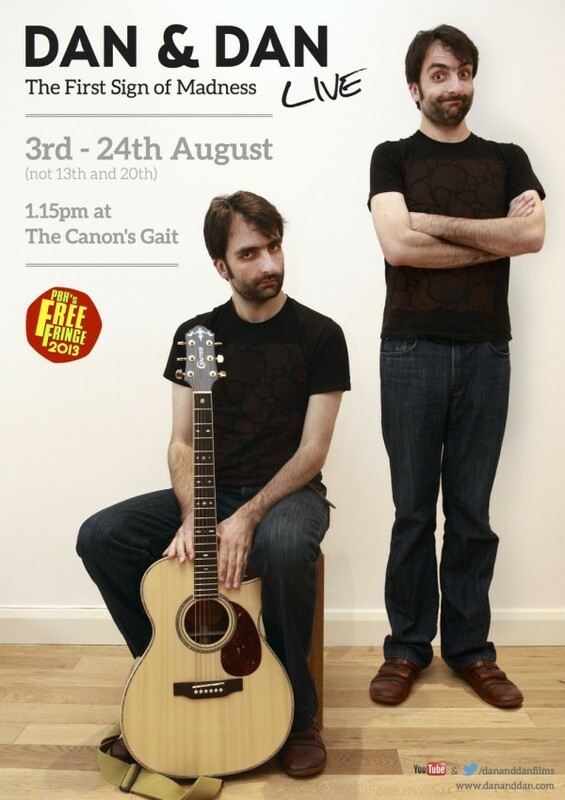 It’s at 1.15pm at the Canon’s Gait venue, as part of PBH’s FREE Fringe and it’s going to be incredibly good fun and might just shatter you to your very core. We’ll be performing songs and will certainly do all the favourites (if you have favourites – if not they may yet become your favourites) and that’s right – you read correctly – it’s FREE. Some people have expressed curiosity at how Dan & Dan would ‘work’ live. Can’t quite see what the confusion is… we both just walk on stage and start chatting and singing. Like everyone does, right?